Our reader asks: the problem is the following. 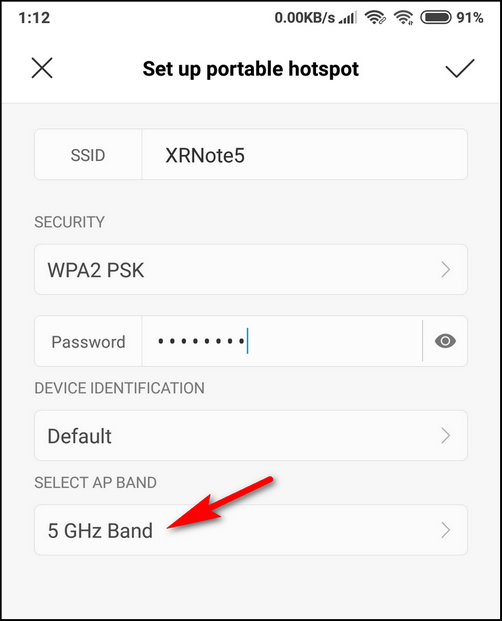 I have set up a mobile hotspot on my Xiaomi Redmi Note 5 and selected the 5 GHz band in its advanced options. I just want it to be visible to as little people as possible. As you might know, not everyone has a device supporting 802.11ac standard and another reason is that 5 GHz Wi-Fi signal covers a way smaller spot. But when I activated the hotspot I found out that my phone is nevertheless distributing 2.4 GHz Wi-Fi. Why does it ignore the settings? The “problem” (which is actually not a problem) hides in peculiarities. The thing is Xiaomi phones are capable of redistributing the Internet obtained via Wi-Fi. The effect when you select 5 GHz but get a 2.4 GHz hotspot takes place only if you connect your Xiaomi phone to a 2.4 GHz Wi-Fi access point or wireless router. In this case its “Portable Hotpot” will also work on the lower band. or connect to a 5 GHz Wi-Fi access point. Restart your Portable Hotspot if no effect (off→on). Thank you for your attention! And by the way, what can you add on the topic? Feel free to write in the comments!